I read about the Eat. Live. 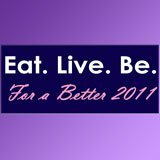 Be for a better 2011 challenge on Eats Well with Others today. An inspiring group of bloggers will be blogging about their own personal journey towards healthy eating this year. I thought I'd take the opportunity to write about my goals for the year. In 2010, I stopped dieting and lost 25 pounds just by changing my outlook on food. To load up on fruits and veggies as I want and try to eat mostly what's in season. I do not believe in counting portions when it comes to fruits and vegetables. And last, to eat VERY little of everything other than produce. I'll eat small portions at meals, and if I want more, I'll reach for a fruit. But I'll never count or measure! What are your goals for this year? Please share them in the Comments section below. Here's to a wonderful 2011! Great list of personal rules! They are very similar to my own. I love that you are going to reach for fruit when you want something more -- it's a great plan. I also enjoy bread, pasta, pizza and dark chocolate. Good thing I also love vegetables. Your goals and tips are great! Have a wonderful 2011! Thank you SO much for joining in with us! Everything in moderation, but mostly fruits and veggies...those are my kind of rules! I love your goals--sometimes the simplest changes (eating REAL food) can make the biggest difference! Great philosophy on eating and living healthy. Thanks so much for your comments on my pictures on my blog--I've actually felt like I'm really struggling with the pictures lately because I have less natural light in the evenings (Spring can't come soon enough!). And believe it or not, the only camera I use is a very basic point-and-shoot camera, my Sony Cyber-Shot. No focusing, no special lenses! My best recommendation is to photograph things by natural daylight when possible (when I have to photograph at night, I end up with a dingy yellow hue to my pics.). I usually just set my plates by a window and snap about 8 - 12 pictures, then pick my favorite. I like your attitude. It is fantastic that you lost the weight this way. BTW, I searched and saw that Pereg carries a version of Hawaij (for soup). You will really like this spice mix. Great in soup. And, speaking of avoiding processed food, I find that it is really a great and healthy substitute for soup cubes. It gives better flavor and only has healthy spices in it--no junk. Great ideas! Though I do think there is a bit too much "hype" around the additives, etc issue with food...I DO think that there is a basis to the idea that that is a piece of the problem! Most of our grandmother's cooked with real foods and you did not see the issue with weight then...but they were also a lot more active. All that said, I think that a goal of cooking with real foods is FANTASTIC! Those are fantastic goals...and goals that can be easily met too! I never think it's wise to deny ourselves certain things..most people just tend to have a problem with portion control. Moderation is key! Good luck to you...I think you are going to do a fantastic job at meeting your goals!